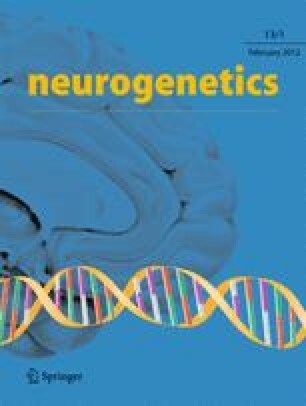 Recent genome-wide association studies have implicated the “signal transducer and activator of transcription 3” gene (STAT3) as a putative new multiple sclerosis (MS) susceptibility locus. However, independent validation studies are sparse. Therefore, we performed a genetic association study of two STAT3 polymorphisms (rs744166 and rs2293152) in a large and independent German case–control sample of 5,904 subjects. We observed a nominally significant, albeit weak association between rs744166 and MS susceptibility (odds ratio = 1.09, P = 0.012) in our sample. This study supports the association between STAT3 and an increase in MS risk. Taking into account the functional role of STAT3, our results favour an involvement of Th17 lymphocytes in MS.
Christina M. Lill and Brit-Maren M. Schjeide are joint first authors. Lars Bertram and Frauke Zipp are joint last authors. We are grateful to the patients and control subjects who participated in this study. Furthermore, we thank all colleagues involved in the recruitment, examination and analyses of MS-free controls recruited as part of the “Berlin Aging Study II” (BASE-II), in particular Drs. Ilja Demuth, Rahel Eckardt, Hauke Heekeren, Martin Lövdén, Ludmilla Müller, Wilfried Nietfeld, Graham Pawelec, Florian Schmiedeck, Thomas Siedler and Gert G. Wagner. This project was funded by grants from the German Ministry for Education and Research (BMBF; to F.Z., L.B., U.K.Z. and U.L. ), German Research Foundation (DFG; to F.Z. ), the Cure Alzheimer's Fund (to L.B. ), the Walter-and-Ilse-Rose-Stiftung (to H.-P.H. and O.A.) and the Innovation Fund of the Max Planck Society (to U.L. ).